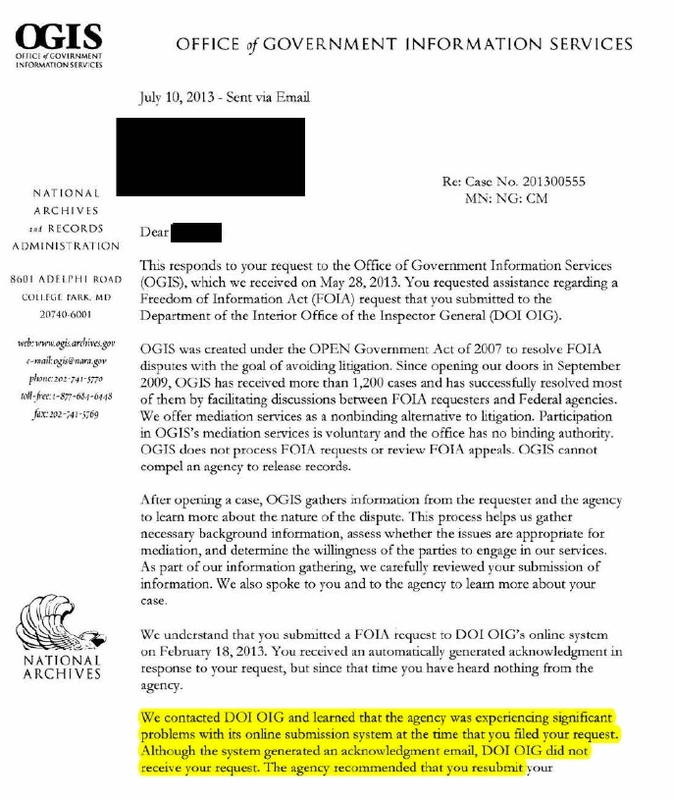 The Office of Government Information Services (OGIS), the federal FOIA ombuds office that provides assistance in FOIA disputes, has begun posting its final response letters to FOIA problems it has mediated. 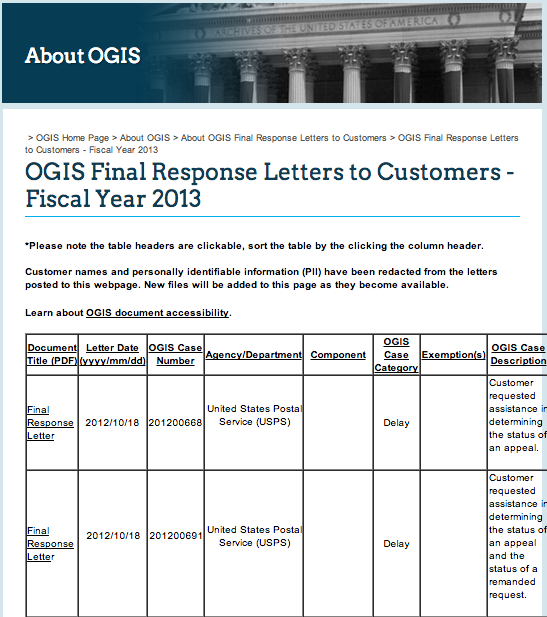 To date, OGIS has posted 21 response letters from 2013 and 2014 on its website. OGIS’ website and blog, The FOIA Ombudsman, are valuable tools for both the requester community and federal agencies, so FOIAphiles should definitely check them out frequently. OGIS’ sleek web presence is also a breath of fresh air when compared to some other government sites. The letters recently posted on the site provide an important and telling (if quantitatively limited) view into problems FOIA requesters and processors encounter. For example: Ever filed a FOIA request on the Department of the Interior’s Inspector General’s website? Better double check that they received it. One letter posted by OGIS reveals that the site experienced “significant problems” and errantly told users that the DOI IG had received their requests when it actually had not. Another posted final response highlighted the exceptional problem of FOIA referrals, pulling back the FOIA curtain to reveal that delay in a request was caused when the Department of Homeland Security located 377 records but –rather than process them for release themselves– referred them to the Department of Energy to process. Unfortunately, the DOE “returned the documents [to DHS] and informed [the DHS FOIA officer] that they were incorrectly referred to DOE.” Referral delays like this occur frequently, but are rarely documented –or made public. In another case, a prisoner in a federal penitentiary requested “records related to inmate ‘lockbox deposits. '” While OGIS confirmed the Bureau of Prisons’ “no documents found” response was reasonable, it also contacted the Bureau of Prisons and learned that the “lockbox deposits” the requester referred to were likely more accurately described as the “Inmate Deposit Fund.” OGIS sent the requester the relevant chapters of the “Trust Fund/Deposit Fund” manual, which was posted on Bureau of Prisons’ website. 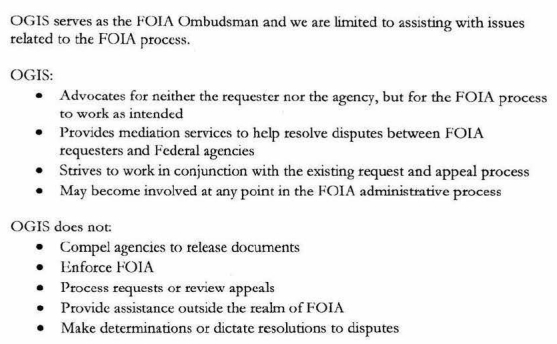 While this relatively small set of final letters is telling and useful, we look forward to when OGIS posts all of its final decisions online so that we can have a more accurate picture of the problems (and possible solutions) facing FOIA processors and requestsers. But by my reading, its Congressional mandate is stronger than how it describes its duties. The 2007 update to the FOIA that established OGIS tasked the ombuds office to: “review policies and procedures of administrative agencies,” “review compliance” of FOIA, and to “recommend policy changes to Congress and the President to improve the administration” of the Freedom of Information Act. The newly established Federal FOIA Advisory Committee (of which I am a member) has pledged that one of its three grand FOIA improvement commitments will be “expanded oversight of the Freedom of Information Act.”1 This small sample of final response letters shows that OGIS has profound knowledge of FOIA, commitment to Open Government, and affords fair treatment to both requesters and processors. These traits, as well as its established tenure, and legislative mandate, make OGIS a strong candidate for the role of FOIA overseer and enforcer. But even if that does not happen, at least OGIS has begun to produce a public catalog of the problems FOIA requesters and processors face.